Kukui nut lei. Hawaiian Lei for any Polynesian events. 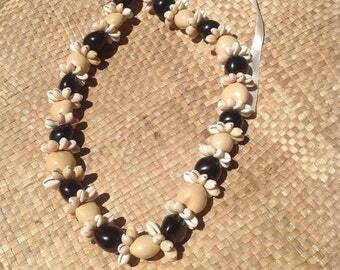 kukui nut lei with white mango shells. Kukui Lei from the ancient past to our modern times this jewel nut of Paradise Island is something to behold and posses. To wear one is a mark of nobility. Each nut are pre-selected quality, all hand crafted sanded and polished. Each piece has a distinct character of it's own, for not two are alike as to color, size, luster. Fashioned and designed into unique piece for you to own and wear with great pride. The shorter length necklace it's a good size for children. Great for a necklace that will last for years ...a wedding, gift. Let me know if you needed more than what I have listed. MEASUREMENTS- This is a 30"-31" inches around and consists of 24 beautiful Kukui Nuts with 10" ribbon on each side. 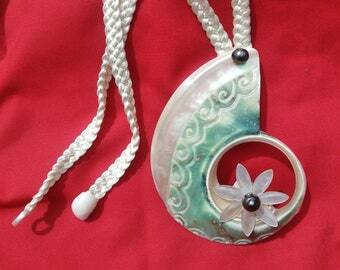 The long necklace is a 30"- 31" inches around & consists of 28 beautiful kukui nuts with 10" ribbon on each side. kukui nuts don't bleed onto clothing. These are very popular in the Polynesian Islands! Brown Kukui Nut Lei Or Necklace..
Kuikui Nut Lei Or Necklace. Hawaiian Black Kukui Lei. Perfect For Luau, Dancers, Wedding, Gifts, Beach Wedding, Or Any Polynesian Events. 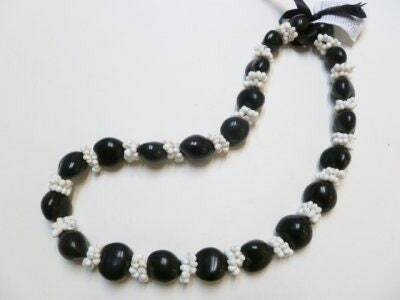 Genuine White, Black Or Brown Kukui Nut Choker For Adult Or Necklace For Young Children! Perfect For Dancers, Luau, Beach Wedding, Gifts!! 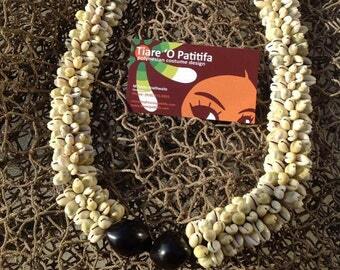 Hawaiian Monita Cowrie Shells & Kukui Nut Lei Choker Or Necklace For Young Children. Perfect For Wedding, Dancers, Luau, Gifts, Graduations. Green/Grey Monita Cowrie Shells Rosettes & Kukui Nut Choker Necklace. Measures Approximately 21" Long. Jewel Nut Of Paradise Island. KUKUI NUT LEI.Genuine White, Black & Brown Kukui Nut Choker For Adult Or Necklace For Young Children! Silk Green/Ti Leaf Lei. Perfect for Wedding, Luau, Beach Wedding, Fathers Day, Mothers Day. My photo taking isn’t so great. I’ve never seen a Kukui nut lei with this beauty. I got one for myself and one for my sister in law. So when I visit her in Maui and she puts a lei on me I can put this lei on her. Thank you so very much! You are very creative! Yellow shell necklace. Perfect For Wedding Favors, Brides And Bridesmaids, Luau, Beach, Gifts..
Brown or Black Kukui Nut Stretchy Bracelet. 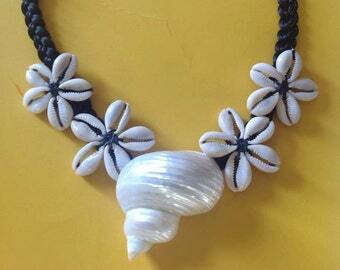 Kealoha Special Handmade Cowrie Shell Necklace. Perfect For Both Male & Female Of All Ages. Beach Wedding, Dancers! !